There is definitely a lot of hustle when it comes to enterprise business. Things move fast, scaling is inevitable, and the last thing the executive team wants to see is stalled growth. That makes having the ability to utilize technology to streamline business processes important. This is especially true when it comes to enterprise business shipping. Time consumption is the biggest growth killer, and shipping can eat up a lot of time. However, the shipping process of any enterprise business can be efficient and cost effective when done right using intelligent shipping technology. Artificial intelligence (AI) is an example. “It could help managers gather data about what’s moving through their warehouses, from the size and weight of packages to how long they sat on shelves, and could analyze that data for inefficiencies far faster than a staff member could,” shipping intelligence providers Reveel Group explained. Do you need to stop the bleeding when it comes to shipping costs, whether monetary or time? The following can serve as your quick guide. Let’s dive in! What Type of Shipping Technology is Right for Your Enterprise Business? The ability to apply technology to your shipping process is essential to streamlining shipping with an emphasis on efficiency and associated decreased costs. If you are presently having issues with your shipping, even with shipping technology in place, it may not have been scalable when you began implementation. This makes having a scalable technology absolutely paramount to ensuring efficient and cost effective shipping. Scout out shipping technology for your enterprise business that has basic, and also very advanced features that will allow you to grow with the technology in place for the long-term. 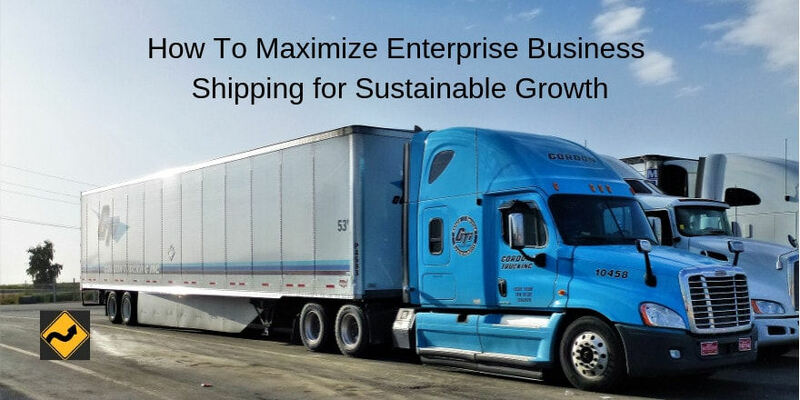 This can be seen in the ecommerce enterprise businesses that continually need to scale up, and by doing so, scale shipping exponentially year over year. The ability to integrate or replace shipping technology within your enterprise business is critical, but it also needs to be practical. For example, you can integrate the greatest technology that solves all your company’s issues. However, if no one can understand it and use it effectively, it is worthless technology. That is why plug and play technology, like SaaS has a place in our ever-advancing, innovative digital business world. The easier it is to use, the better. This ensures employees can onboard with it quickly, because remember, there is a time cost as well. Even though your customers are not directly suing your shipping technology, they are essentially the end user. Why? Because they need important shipping information throughout the process. This information can be easily automated by utilizing the right technology. For instance, customers can get tracking and fulfillment information in real-time just by entering their customer dashboards or by simply checking their emails. Reliability is very important when it comes to technology of any kind, but even more so when shipping is part of the equation. How do you know if a shipping technology is good? Luckily you have the internet. Check vendor reviews and ratings, ensure they have quality support channels, and more. Having reliable technology makes a big difference, and could save on shipping costs down the road. Outbound, forward supply chain and logistics is one part of the battle when it comes to shipping. Next, you need to think about the reverse logistics aspect as well. Returns have become a big part of enterprise business processes, especially since annual returns were valued at $360 billion in 2018. Returns are in many ways more time consuming, and more expensive. For instance, when a return comes back to your company, where is it warehoused and handled in order to get the most recovery on that return in the fastest amount of time? These are expensive questions enterprise businesses need to answer. This makes simplifying returns a priority for companies in 2019. The USPS has become a pretty good option for businesses. They offer convenience and affordability when it comes to returns shipping. This is due to the scalable shipping technology they have in place, as well as resources for consumers with over 30,000 retail outlets and 180,000 collection areas. If it’s time for your enterprise business to change the way shipping is done, think about better shipping technology. And even if you have something in place, it may be best to make a change in order to stop the bleeding of both time and money for your company. What shipping solutions do you use successfully? We want to hear from you. The scalable point is well taken. I observed this being a security guard in a shipping terminal, watching trucks head in and out of the docks daily. Businesses on point had scaling in mind so they had no problems growing and expanding. Yes, hitting a wall while trying to scale is a common issue. Often, you don’t know what that challenge will be until you find out your current solution can’t handle what you need to do.